290 Marlborough is located on the south side of Marlborough, between Fairfield and Gloucester, with 288 Marlborough to the east and 292 Marlborough to the west. 290 Marlborough was designed by Ware and Van Brunt, architects, and built in 1872 for builder and contractor George Martin Gibson, for speculative sale, one of five contiguous houses (284-286-288-290-292 Marlborough) designed as a symmetrical composition: 284 and 292 Marlborough are mirror images of each other, each with a turreted bay; they flank 286-288-290 Marlborough, which have stepped (curvilinear) Dutch-style gables. At about the same time, Ware and Van Brunt also designed three additional houses for George Gibson, 282 Marlborough and 7-9 Fairfield. George Gibson and his wife, Frances Rebecca (Esten) Gibson, lived in the Longwood district of Brookline and then in Medford. Click here for an index to the deeds for 290 Marlborough. On October 7, 1872, 284 Marlborough was purchased from George Gibson by George Walker Weld. He lived at 1 Arlington with his parents, shipping merchant William Fletcher Weld and Isabella Melissa (Walker) Weld, and was associated with his father’s firm. That same month, he also had purchased 284 Marlborough from George Gibson; it became the home of his brother-in-law and half-sister, George Hamilton Perkins and Anna (Weld) Perkins. On August 20, 1874, 290 Marlborough was purchased from George W. Weld by Fanny B. (Churchill) Locke, the wife of wholesale grain merchant Joseph Henry Locke. They previously had lived on Moseley Avenue in Dorchester. They continued to live at 290 Marlborough during the 1877-1878 winter season, but moved thereafter to New York and by 1880 were living in Englewood, New Jersey, Fanny Locke continued to own 290 Marlborough and lease it to others. By the 1878-1879 winter season, 290 Marlborough was the home of John Evart De Witt and his wife, Naomi (Hawley) De Witt. They previously had lived at 4 Arlington. They also maintained a home in Portland, Maine. John De Witt was president of the Union Mutual Life Insurance Company of Maine. 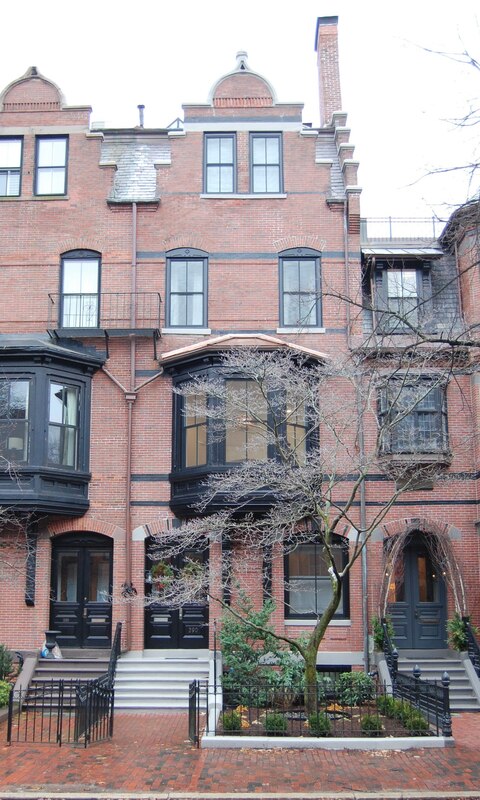 They continued to live at 290 Marlborough during the 1880-1881 season, but moved thereafter to Portland. By the 1881-1882 winter season, 290 Marlborough was the home of silverware manufacturer Lewis Edwin Jenks and his wife, Phoebe Ann Pickering (Hoyt) Jenks, an artist. 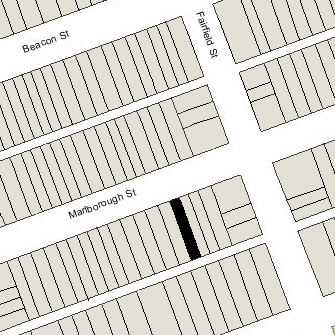 They previously had lived at 310 Marlborough. The Jenkses initially leased 290 Marlborough from Fanny Locke. On October 27, 1884, Phoebe Jenks purchased the house from her. Lewis Jenks died in August of 1888. 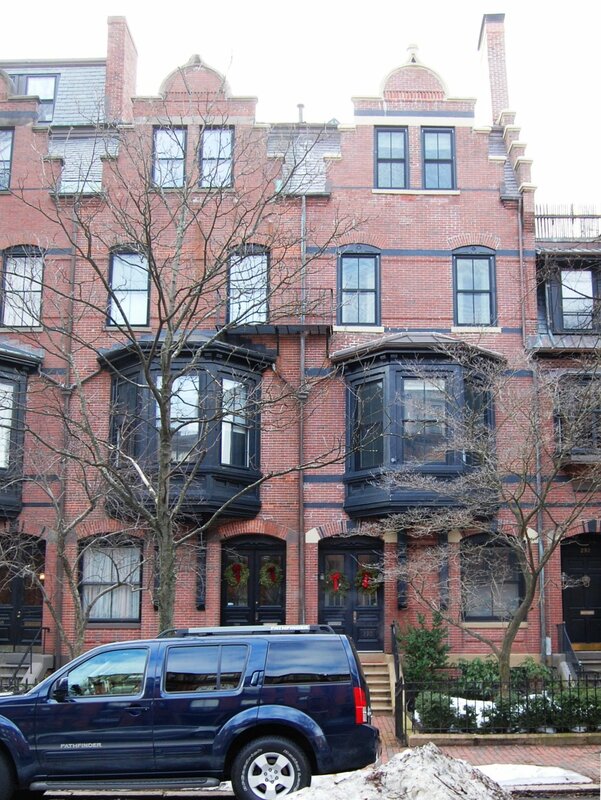 Phoebe Jenks continued to live at 290 Marlborough. She also maintained a studio at 5 Otis Place in the home of Dr. William Edward Faulkner, a physician and surgeon. He married in July of 1906 to Elizabeth Rosalie Edwards. After their marriage, they lived at 5 Otis Place and Phoebe Jenks continued to maintain her studio there. Phoebe Jenks died in January of 1907. In her will, she named Ignace Marcel Gaugengigl, another artist, as the residual legatee of her estate. He refused to accept the bequest, indicating that Mrs. Jenks was under medication and of unsound mind when she made the will. The will subsequently was disallowed and the estate, including 290 Marlborough, was inherited by the Jenkses’ only child, Barton Pickering Jenks. Barton Jenks and his wife, Agnes Marie (O’Leary) Jenks, lived in Concord, New Hampshire, where he was president and general manager of William B. Durgin Company, manufacturers of silverware. They had married in October of 1892, before which she had been a stage actress performing under the name Agnes Acres. Her sister, Miriam O’Leary, also was an actress. On December 18, 1909, Barton Jenks transferred 290 Marlborough to his wife. The Faulkners continued to live at 290 Marlborough (and he to maintain his office there) until 1922, when he retired and they moved to Keene, New Hampshire. By the 1922-1923 winter season, 290 Marlborough was the home of Rt. Rev. Charles Lewis Slattery and his wife, Sarah (Lawrence) Slattery. They had married in November of 1923, and 290 Marlborough was their first home together. Charles Slattery was Episcopal Bishop Coadjutor of Massachusetts; in 1927, he succeeded his father-in-law, William Lawrence, as Bishop of Massachusetts when Bishop Lawrence retired. The Slatterys leased 290 Marlborough from Agnes Jenks. On November 19, 1924, she transferred the property to Ruth Blanchard. Barton and Agnes Jenks may have separated at about this time. Ruth Blanchard continued to hold the property until 1929, when she transferred it back to Agnes Jenks, with the deed dated December 15, 1924, but not recorded until June 11, 1929. Charles and Sarah Slattery continued to live at 290 Marlborough during the 1928-1929 winter season, but moved thereafter to 175 Beacon. During 1929-1930 winter season, Agnes Jenks made 290 Marlborough her home. Her son and daughter-in-law, Barton Pickering Jenks, Jr., and Andrée (Fritsch) Jenks, and their two children, Barton and Peter, lived with her. They all previously had lived in New York City, where Barton Jenks, Sr., continued to live. Barton Jenks, Jr., was an architect; his wife was French and they had lived in France in the mid-1920s when their children were born. By the 1930-1931 winter season, 290 Marlborough was the home of Mary Louise (Daisy) Charleville (Taylor) Chase, the widow of Stephen Chase. She previously had lived at 3 Fairfield. In 1932, she was joined at 290 Marlborough by Frederick Munroe Burnham, a stockbroker and trustee, and his wife, Rosamond (Eliot) Burnham. They previously had lived at 291 Commonwealth. By 1933, they had moved to 144 Mt. Vernon. Daisy Chase continued to live at 290 Marlborough during the 1933-1934 winter season, but moved thereafter. On April 14, 1934, 290 Marlborough was purchased from Agnes Jenks by Edith Pauline (Richburg) Brown, the wife of Charles Frederick Brown, a display manager and decorator. They previously had lived in Brookline. They continued to live at 290 Marlborough through the 1935-1936 season. On September 28, 1936, 290 Marlborough was purchased from Edith Brown by the Granite Realty Corporation. By mid-1937, 290 Marlborough was the home of Frederick Allen Marsden, a retired physician. He had lived at 354 Beacon in 1936. On July 27, 1937, the Boston Globe reported that the police had raided 290 Marlborough and arrested Frederick Marsden for posing as a doctor and operating a “rejuvenation parlor” (which, from the article’s description, appears to have been a massage parlor; Frederick Marsden had listed his occupation as masseur in his World War I draft registration and the 1920 US Census, but as a physician in the 1922 and later Boston City Directories). On March 18, 1938, the Merchants Co-operative Bank foreclosed on its mortgage to Edith Brown, which had been assumed by Granite Realty, and took possession of 290 Marlborough. On September 23, 1938, the property was acquired from the bank by Bertha M. Reutter of Newton. 290 Marlborough was not listed in the 1937 Blue Book, and was shown as vacant in the 1937-1941 City Directories. On March 1, 1941, 290 Marlborough was acquired from the Merchants Co-Operative Bank by Edward Wexler. In March of 1941, he applied for (and subsequently received) permission to convert the property from a single-family dwelling into nine apartments. On June 3, 1943, 290 Marlborough was purchased from Edward Wexler by Morris Binder (Moische Kaftan), a dress manufacturer. He and his wife, Mollie (Weiner/Weinerman) Binder lived in Dorchester. In September of 1954, he filed for (and subsequently received) permission to legalize the occupancy as ten apartments, which he indicated was the condition when he bought the property. Morris Binder died in September of 1971, and on August 14, 1972, 290 Marlborough was acquired from his estate by Anne Dolce and Andrew Saggesse, Jr., trustees of the A & D Realty Trust. On June 7, 1973, they transferred the property to Andrew Saggesse, Jr. 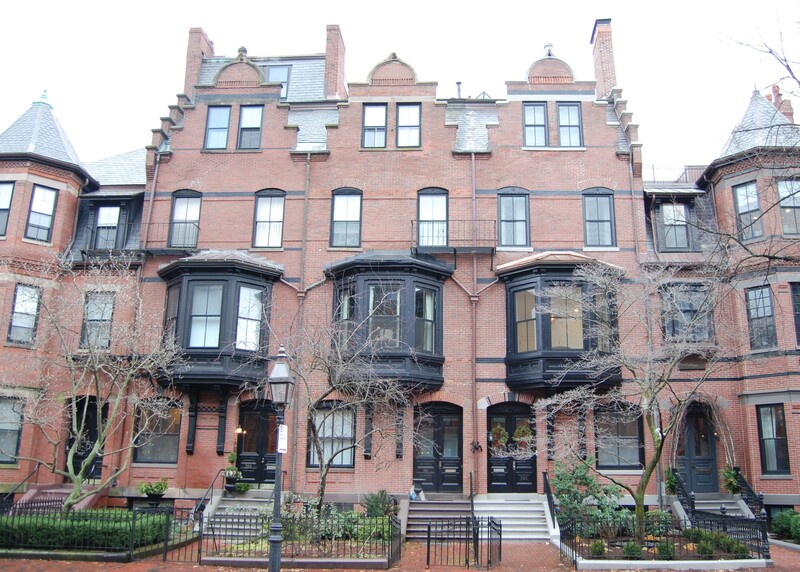 The property changed hands and on July 21, 2006, was purchased by real estate developers John Holland and Joseph Holland, as trustees of the 290 Marlborough Street Realty Trust. In August of 2006, they applied for (and subsequently received) permission to convert the property from ten apartments into a single-family dwelling. On July 16, 2007, 290 Marlborough was purchased from the Hollands by the Nahant Willow LLC (John McGrail, manager of record).